Workman Publishing Company, 9780761171768, 68pp. Hang on to yer hat, Cowboy. Yeeeee-hah! 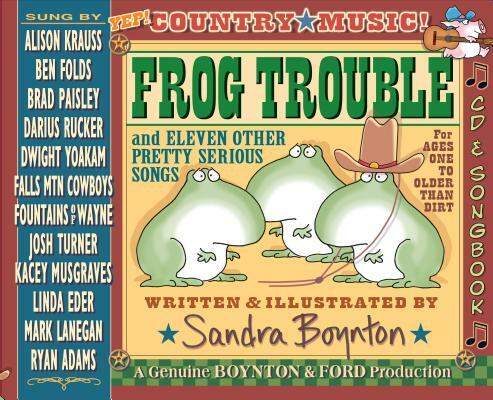 Boynton goes Country with Frog Trouble, a terrific CD and illustrated songbook of her new and wildly original Country songs. And they’re sung by a truly amazing roster of Country Music’s biggest and brightest stars: Here’s Brad Paisley with "Copycat," Dwight Yoakam singing "I’ve Got a Dog," Alison Krauss on "End of a Summer Storm," Ben Folds rocking "Broken Piano," Darius Rucker with "Beautiful Baby." The lonesome-cowboy title track is performed by the low-voiced moody rocker Mark Lanegan (yes, of Queens of the Stone Age.) Add Josh Turner, Fountains of Wayne, Kacey Musgraves, and other artists—all accompanied by Nashville’s finest instrumentalists—and WHOA. You’ve got yourself some mighty fine music, with a whole lot of gumption and heart. • Retro sound with a TRULY AMAZING All-Star Artist roster!